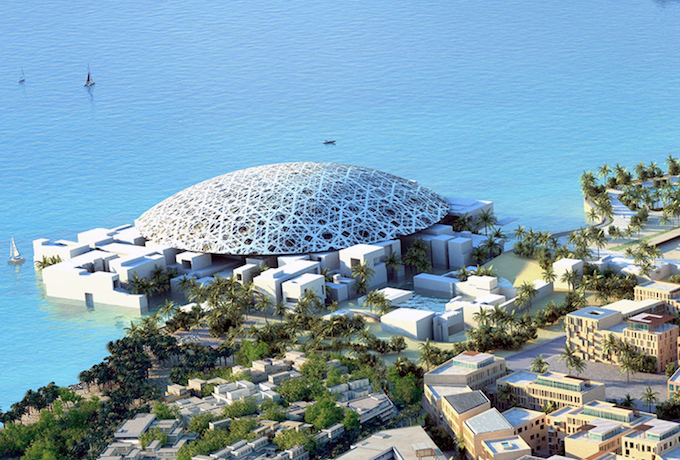 The UAE’s latest major tourist attraction Louvre Abu Dhabi will open its doors to the public on 11 November 2017. Opening celebrations are set to include a wide range of public programmes, including symposiums, performances, concerts, dance, and visual arts by renowned contemporary and classical artists. The museum is the first of its kind in the Arab world, and will focus on shared human stories across civilisations and cultures. Located in Abu Dhabi, the capital of the United Arab Emirates (UAE), Pritzker Prize-winning French architect Jean Nouvel has designed a museum city (Arab medina) under a vast silvery dome. Visitors can walk through the promenades overlooking the sea beneath the museum’s 180-metre dome, comprised of almost 8,000 unique metal stars set in a complex geometric pattern. When sunlight filters through, it creates a moving ‘rain of light’ beneath the dome, reminiscent of the overlapping palm trees in the UAE’s oases. On display will be the museum’s important collection of artworks, artefacts and loans from France’s top museums. These span the entirety of human existence – from prehistorical objects to commissioned contemporary artworks, highlighting universal themes and ideas and marking a departure from traditional museography that often separates according to origin. In addition to the galleries, the museum will include exhibitions, a Children’s Museum, a restaurant, a boutique and a café. His Excellency Mohamed Khalifa Al Mubarak, Chairman of Abu Dhabi Tourism & Culture Authority (TCA Abu Dhabi) and Tourism Development & Investment Company (TDIC), said: “Louvre Abu Dhabi embodies our belief that nations thrive on diversity and acceptance, with a curatorial narrative that emphasises how interconnected the world has always been. The museum represents the latest innovation in a long-standing tradition of cultural preservation nurtured by the founding leaders of the UAE. “Louvre Abu Dhabi forms one element of Abu Dhabi’s cultural strategy, which safeguards our rich heritage and catalyses creativity. Investment in a vibrant cultural ecosystem supports the UAE’s economic diversification and development as a modern, dynamic society,” he added. Her Excellency Ms. Françoise Nyssen, the French Minister of Culture, added: “The opening of the Louvre Abu Dhabi will be a milestone in the development of the cooperation between the United Arab Emirates and France, ten years after the signature of the intergovernmental agreement. Jean Nouvel, the architect of the Louvre Abu Dhabi, said: “After several years of studies and construction, guests will be able to enter this place of light, this revelatory meeting place of a number of planetary cultures beyond the seas and centuries. The intergovernmental agreement includes the loan of the Musée du Louvre’s name for 30 years and six months, temporary exhibitions for 15 years, and loans of artworks for 10 years.